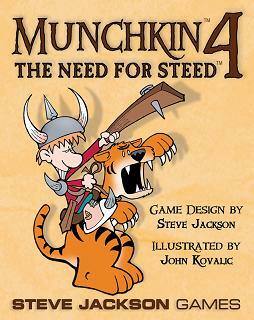 Munchkin 4: The Need for Steed is the latest expansion for the original Munchkin - 112 more John Kovalic-illustrated cards for killing monsters, stealing treasure, and backstabbing your fellow players. This set introduces Steeds, the trusty mounts of legend . . . Oh, wait - this is Munchkin! So these Steeds include not just the Dragon and the Tiger, but the Giant Mutant Gerbil, the Chicken, and Big Joe, who might be a Steed or might be a Hireling. It`s hard to tell.